This page tells you the terms and conditions on which we supply any of the products listed on our website www.hambledenherbs.com (“our site”) to you. Please read these terms and conditions carefully before ordering any products from our site. You should understand that by ordering any of our products, you agree to be bound by these terms and conditions. You should print a copy of these terms and conditions for future reference. Hambleden Herbs Ltd is the exclusive owner of the Hambleden Herbs trade mark and designs, and all other company names and logos are the property of their respective owners. Your order to buy on our site constitutes an offer, which can then be accepted by Hambleden Herbs by the dispatch of the products ordered (a “Sale” or “Purchase”). All products presented for purchase on our site are subject to availability. Please be aware that for products dispatched overseas Hambleden Herbs is not responsible for the payment of any import duty, customs charges or any other fees levied locally for such products, and that you may be asked to pay any such duty, charges or fees at the point of delivery. We endeavour to process all orders upon receipt and aim to pack your order and prepare it for dispatch within 48 hours. Delivery times are normally 3 to 7 days for the UK and 7-15 days for deliveries outside the UK. Hambleden Herbs will use all reasonable endeavours to meet the above guidelines but would appreciate your understanding that this is not always possible due to the popularity of some products and the fact that some of our more unusual organic herbs and spices may not be held as packed stock. If an item in your order is out of stock, we will inform you by phone or e-mail and will provide you with an estimate for the time it will take us to obtain the item and prepare it for dispatch. You may, at any time up to dispatch of the items ordered, cancel or amend your order by informing us in writing either by email to: orders@hambledenherbs.com or letter to: Hambleden Herbs Ltd, Unit 6, Park Street Business Centre, Chatteris, Cambridgeshire, PE16 6AE. You will receive a full refund for the items you have cancelled usually via the same method of payment used to place your order. We wish to ensure your absolute satisfaction with our products. If for any reason you are unhappy with your purchase, you should inform us, in writing either by e-mail or letter to the addresses above, of your intention to cancel the order within 15 days of receipt by you of the Purchased product(s) and you should return the Purchased product(s), in original condition and at your own expense, within a further 15 days of such notice of cancellation. Original condition means unused, unopened, undamaged, with the packaging and any tamper-proof seals intact. You will receive a full refund which shall usually be made via the same method of payment used to place your order. Hambleden Herbs makes every effort to ensure that products arrive in perfect condition. However, in the unlikely event of a product arriving damaged, customers should contact us as above within 5 days of receipt of the product and return it within 10 days for a replacement to be sent. The price of any products will be as quoted on our site from time to time, except in cases of obvious error. These prices include VAT where applicable but exclude delivery costs, which will be added to the total amount due as detailed on our site. Prices are liable to change at any time, but changes will not affect orders in respect of which we have already received your order. Our site contains a large number of products and it is always possible that, despite our best efforts, some of the products listed on our site may be incorrectly priced. We will normally verify prices as part of our dispatch procedures so that, where a product’s correct price is less than our stated price, we will charge the lower amount when dispatching the product to you. If a products correct price is higher than the price stated on our site, we will normally, at our discretion, either contact you for instructions before dispatching the product, or reject your order and notify you of such rejection. We are under no obligation to provide the product to you at the incorrect (lower) price, if the pricing error is obvious and unmistakeable and could have reasonably been recognised by you as a mis-pricing. Payment for all products must be by credit or debit card. 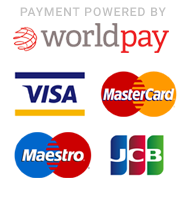 We accept payment with Switch/Maestro, Visa Delta Debit, Solo, American Express, MasterCard and Visa Credit cards. We will not charge your credit or debit card until we have prepared your order for dispatch. The Products will be at your risk from the time of delivery. Ownership of the products will only pass to you when we receive full payment of all sums due in respect of the products, including delivery charges. To ensure your credit card safety and in order to keep your personal details safe, all transaction information passed between our site and the Protx VSP Payment Systems is encrypted using 128-bit Secure Sockets Layer (SSL) technology. No cardholder information is ever sent unencrypted and nothing sent to the Protx servers can be examined, used, modified or manipulated by any third parties. If you still do not feel comfortable with the security of internet transactions, we are of course happy to accept your order by phone or fax. Our performance under any Sale is deemed to be suspended for the period that the Force Majeure Event continues, and we will have an extension of time for performance for the duration of that period. We will use our reasonable endeavours to bring the Force Majeure Event to a close or to find a solution by which our obligations under these terms and conditions may be performed despite the Force Majeure Event. Also, where the Purchased product is not accepted or is rejected by the Customs and Excise (or other official) of any country for any reason, Hambleden Herbs shall not be obliged to ensure delivery but shall, within a reasonable period of it being notified of such a rejection, provide a full refund. This refund shall usually be made via the same method of payment used to place your order. Whilst we will also attempt to notify you of this problem this may not always be possible. Your privacy is important to us. We will only use the information we collect about you in accordance with the Data Protection Act 1998. On our site you can order our products, request information and register for promotions or competitions, as a result of which you will be submitting personal information such as your name, address, e-mail address, phone number and credit/debit card information. You may even submit the name, address and phone number of other people if, for instance, you are ordering a gift for them online. Personal information is primarily collected in order to process an order you may place on the site, but may also be stored in order that we provide you with information which you have specifically requested, for instance on upcoming offers or promotions. We also need your contact details in order to provide you with the best possible service, to inform you if an item is out of stock or to update you on the status of an order. We will not e-mail you or otherwise contact you beyond the service we provide for an order you have placed if you have chosen to opt out of the marketing communication we provide. We do not sell, rent or otherwise make available to third parties any personal information you may submit during a visit to our site. Any child or young person under the age of 16 is advised to get the permission of a parent or guardian before submitting any personal data to our site. We do not collect or store any information from those we know to be under 16. You will be subject to the policies and terms and conditions in force at the time that you order products from us, unless any change to those policies or these terms and conditions is required to be made by law or governmental authority (in which case it will apply to orders previously placed by you), or if we notify you of the change to those policies or these terms and conditions before you make an offer to purchase a Product. We may use technology such as “cookies” to track traffic patterns through the site by assigning a “User ID” to your browser. These cannot be used to identify any specific user but they can be used to identify your computer. Unless you tell us we will never know who you are, even if a cookie is assigned to your browser. You should be able to modify your browser settings if you do not wish your computer to be identified in this way, however, if you do disable cookies you may not be able to make use of all the features on our site. The trade marks, copyright and all other intellectual property rights in or relating to Hambleden Herbs Ltd are and shall remain the property of Hambleden Herbs Ltd, or, in the case of third party content, its licensors. You shall not use, borrow, remove or alter any trademarks, copyright symbol, or any other information, identification or symbol relating to the authorship or ownership of any of the data belonging to Hambleden Herbs Ltd. Links on our site may lead to other websites. We accept no responsibility for the content, accuracy or function of such websites nor do we endorse the contents of such sites. We warrant to you that any Product purchased from us through our site is of satisfactory quality and reasonably fit for all the purposes for which products of the kind are commonly supplied. Our liability for losses you suffer as a result of us breaking this agreement is strictly limited to the purchase price of the Product you purchased. Any information, hints or suggestions given on our site in relation to the treatment of medical conditions is intended as a guide only and is not intended to diagnose, treat or cure any condition or individual. We strongly recommend you seek professional advice and inform your health practitioner or medical herbalist if you purchase any product on this site for the purpose of improving a previously diagnosed or suspected medical condition. Special care should be taken when any product is taken during pregnancy, when intending to treat children or the elderly, or for any ongoing medical condition. If any of these terms and conditions are determined by any competent authority to be invalid, unlawful or unenforceable to any extent, such term, condition or provision will to that extent be severed from the remaining terms and conditions which will continue to be valid to the fullest extent permitted by law. These terms and conditions and any document expressly referred to in them represent the entire agreement between us in relation to the subject matter of any Sale and supersede any prior agreement, understanding or arrangement between us, whether oral or in writing. We each acknowledge that, in entering into a Sale, neither of us has relied on any representation, undertaking or promise given by the other or be implied from anything said or written in negotiations between us prior to such Sale except as expressly stated in these terms and conditions. Neither of us shall have any remedy in respect of any untrue statement made by the other, whether orally or in writing, prior to the date of any Sale (unless such untrue statement was made fraudulently) and the other party’s only remedy shall be for breach of contract as provided in these terms and conditions. These terms and conditions and all Sales via the internet shall be governed by and construed in accordance with English Law and all parties submit to the exclusive jurisdiction of the English Courts.